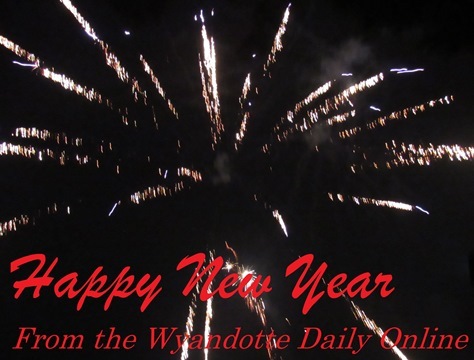 December 2018 – Welcome to Wyandotte Daily! The victim of a fatal accident at 9:27 p.m. Dec. 29 near Kansas Avenue and 10th Street has been identified. The victim was Octavia Barker, 47, of Kansas City, Kansas, according to a Kansas Highway Patrol crash report. Barker was driving a Chevy Spark that was hit by a speeding car, according to a police statement and trooper’s report. The Audi A4 ran a red light and then hit the Spark, pushing it into a Chevy Aveo, according to the trooper’s report. The occupants of the Audi were at large. Two other persons in the Spark were injured and were taken to a hospital, the trooper’s report stated. Two occupants of the Aveo were also injured and taken to the hospital. A Kansas City, Kansas, police spokesman stated at the time of the wreck that police had been chasing the Audi, but had stopped the pursuit at 8th Street and Central Avenue. When it’s time to take down your natural holiday trees and wreaths, you can recycle them at places in Wyandotte County and the metropolitan area that will accept them. Recycling the holiday tree will keep it out of landfills and will use it for a variety of purposes, that may include trail surfaces, erosion control, landscaping and fish habitat in local lakes. “All residents in the Kansas City metro area have many options for recycling their natural holiday trees and greenery,” said Matt Riggs, outreach coordinator for the MARC Solid Waste Management District. Visit RecycleSpot.org, call 816-474-8326 or check the list below for locations throughout the metro area that will recycle your trees and greenery. Most services are free. The Wyandotte County locations are for Wyandotte County residents. Residents of other areas have recycling locations near their residences, found at RecycleSpot.org. According to a Unified Government social media post, residents of Wyandotte County may drop off their tree for recycling from Dec. 26 through Jan. 31. All tinsel, lights and ornaments must be removed. All drop off locations will be clearly marked with a sign.